End of The Road Festival is located at Larmer Tree Gardens, near Blandford, in Dorset. End of The Road 2019 takes place from 29 Aug – 1 Sept. Please check term dates. Driving times from Google Maps just to give you an idea of where we are. It’ll take a bit longer at festival time.Please help us keep the festival green and use public transport wherever possible. Early arrivals on Thursday will be allowed into the car park from 12pm. The village will first open at 5pm on Thursday, with only Woods Stage, Cinema and Tipi Tent open. The music starts about midday on all other days. Please note: Outside the Box Office and Wristband Exchange hours you will be allowed into the car park but not into the festival. All patrons must leave the site by midday on Monday. There is a fee of £15 for car parking payable on entry. There are no advance car park sales for 2019. Please have cash ready and only pay our official stewards. It’s a once-only charge – you can come and go freely thereafter. The car park is about 600 metres from the first campsite. Vehicles cannot be driven into the campsite. If anyone in your party has difficulty walking this distance, please speak to a steward on arrival. Campervans / caravans / live in vehicles need a ‘Campervan Pitch’, which needs to be purchased online in advance at an additional cost. This area is located separately from the main campsite. There are two types of passes, a ‘Regular Campervan Pitch’, this allows for a pitch that is 6m x 8m with space for 1 x live in vehicle OR 1 x caravan, PLUS 1 x small awning (max 2 person). The other type is is a ‘Large Campervan Pitch’, this allows for a pitch that is 9m x 8m with space for 1 x live in vehicle OR 1 x caravan, PLUS 1 x awning / tent (max 4 person). Note that the festival is unable to accommodate vehicles longer than 9m, including double decker buses. Note that cars used for towing will be parked separately within Orange Campsite. Please Note: Accessible camping and accessible parking need to be booked in advance. Please email access@endoftheroadfestival.com to do so. TheAccessible Campsite is located at the bottom of the drive, just past the Box Office. There is more information on Accessible Campsite facilities here. Please note: there is industrial action affecting Southwest Railway this weekend, impacting some routes to Salisbury station. Please check here which services will be affected before travelling. If you are arriving on Thursday or Friday this can be our busiest times, so please plan ahead and make sure you have water with you whilst waiting to enter the festival site. Once parked, ticket holders can go straight to wristband exchange. Children will be given their own wristbands with space to write their parents’ mobile numbers in case they get lost. You may be asked for ID upon arrival, so to be on the safe side, please bring either your passport, driving licence or credit/debit card. If ID is for proof of age it needs to be a PASS card, driving licence or passport. We take your safety and security really seriously. Our teams at Wristband Exchange will be carrying out thorough bag searches so remember to check out our list of prohibited items before you start packing your bags! The Box Office is not able to hold tickets for you or your friends. Please ensure everyone has his/her own ticket before arriving on site. We have 6 camping areas: General, Family, Boutique, Accessible, Campervan and Quiet. More information on the facilities available in each area can be found here. • The main First Aid Tent is located across from the pavilions. In the campsites, go to either of the two large watch towers and the stewards will contact the medics. 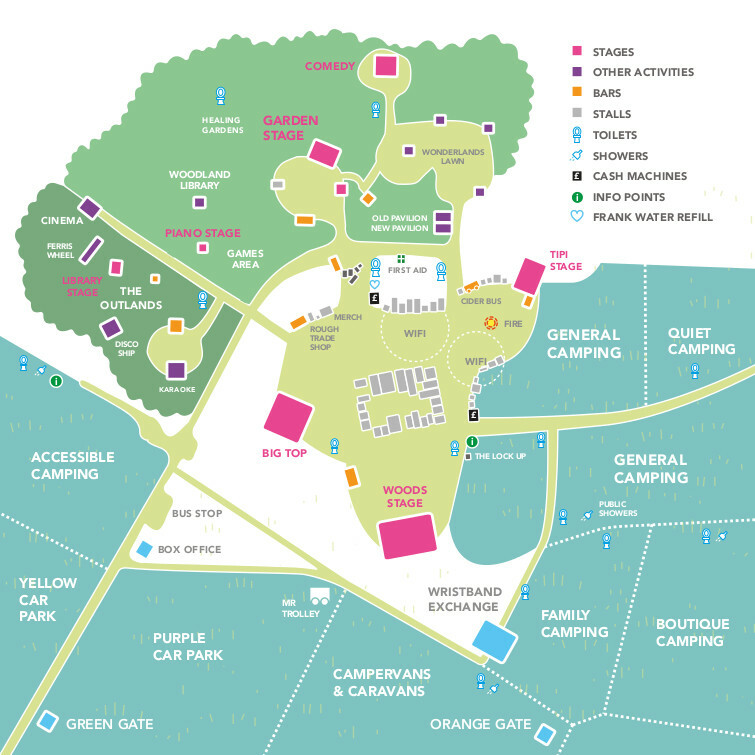 • The Information point is located at Gate C on the main campsite road close to the Woods Stage. • Lost property will held at the Information point for the duration of the festival. Should you be searching for items after the festival has ended, please email info@endoftheroadfestival.com with a description of your item(s) and a member of staff will assist you where possible. • All our water points are suitable for drinking. The water in the toilets is not drinking water. • Cash machines are beside the Information Point at Gate C on the campsite road. • A free lock up scheme is run by Friends of the Earth from Thursday at 2pm. It faces the main campsite near the Woods Stage entrance to the village at Gate C.
• Don’t leave valuables unattended in your tent. During the night, keep them in an inaccessible place such as your sleeping bag. • Put your phone number on your child’s wristband. • Exposure to loud noise can damage your hearing. Do come prepared with well-fitting ear protection for you and your children. • We have a zero tolerance policy to sexual harassment and sexual abuse. If you experience or witness sexual harassment or sexual abuse at End of the Road, please report it to our Welfare Team who are located at the First Aid tent. They have a safe space for you to discuss any issues confidentially and discreetly. • Smoke inside any of the festival tents. This is the law. • Drugs – Big NO! We have a zero tolerance policy and your stay with us will be short. • Bring glass on site. Security will search for and dispose of any glass at the entrance. • Bring pets other than guide dogs. • Make a lot of noise in the campsite… we’re sure you can see the sense in this one. • Make open fires or barbecues (camping stoves used away from tents are fine). • Take camping chairs, trolleys and ground blankets forward of the Woods Stage sound desk and Garden Stage sound desk after 5pm, or into the Tipi Stage after 5pm. • Bring flags into the festival village. These are permitted in the campsite only. • Music starts around midday Friday – Sunday. We are opening The Woods Stage on Thursday night again this year for some extra music, along with some of the bars and food stalls. There will be some entertainment in the Tipi and Cinema tents on Thursday night too, as usual. • It gets cold at night so remember to bring warm sleeping bags, extra blankets and (if you like) air beds. • There is a festival shop in the general campsite just before you enter the village for all those vital bits and pieces you forgot.